An empanada is a Spanish and Portuguese stuffed bread or pastry, also known as “impanada” in Italy. The name comes from the verb empanar, meaning to wrap or coat in bread. 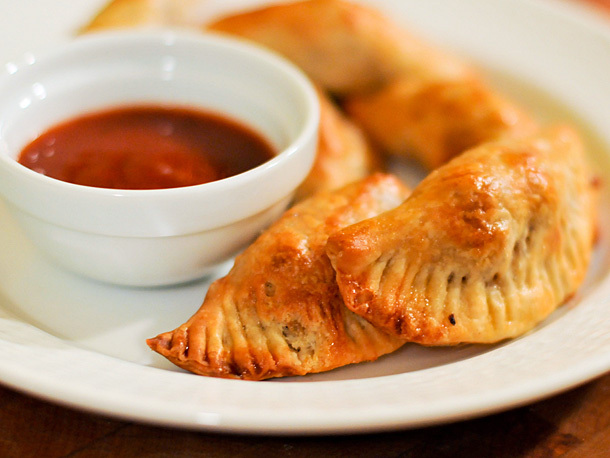 Empanada is made by folding a dough or bread patty around the stuffing. In Spain, empanadas are usually large and circular in shape and are cut into smaller portions for consumption, whereas in Portugal and South America empanadas are normally small and semi-circular (this type of empanada is commonly known as empanadilla in Spain). Empanadas are also known by a wide variety of regional names (see the entries for the individual countries below). In Spain the dish is known as Galician empanada or simply empanada, whereas in Portugal it is only known as “empada”. It is likely that empanadas in the Americas have their origins in Galicia, Spain and Portugal, where an empanada is prepared similar to a large pie which is cut in pieces, making it a portable and hearty meal for working people. The filling of Galician and Portugal empanada usually includes either tuna, sardines or chorizo, but can instead contain cod fish or pork loin. The meat or fish is commonly in a tomato, garlic and onion sauce inside the bread or pastry casing. Due to the large number of Galician immigrants in Latin America, the empanada gallega has also become popular in that region. The dish was carried to South America by colonists, where they remain very popular to this day. Empanadas in South America have various fillings.